True Crime/Fiction Wins 110 Stars From 23! The number one song is Bette Davis Eyes. John Hinckley, Jr. shoots President Reagan. One computer occupies an entire wall. No cell phones or metal detectors. The World Series Dodgers beat the Yankees in six. Teachers date students. Potheads out-number alcoholics. It’s 1981, and pandemonium strikes the biggest U.S. drug deal in history in a raging storm fifteen miles off the Jersey Shore! Order your print copy or E-book NOW! The men stop inches from where the last wave sprawls across the sand. Maddigan is shaken to the core. His anger quickly gives way to fear. He’s doing everything he can to keep his knees from knocking. “Okay, what’s the story, Slam? he mutters between tight teeth. “The couple (JP and the professor) is fun and tense at the same time. Readers will feel like they are in the middle of a blooming relationship. Can 23 out of 23 reader reviews be wrong? NEWS BULLETIN UPDATES . 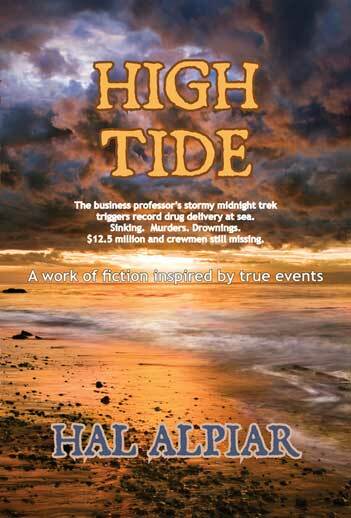 . . HIGH TIDE IS NOW AVAILABLE on AMAZON.com and you can order it from any bookstore for immediate delivery by the distributor, INGRAM BOOKS. Be sure to visit again AND PLEASE SEND FRIENDS, FAMILY and ASSOCIATES to see what your contribution of support and or finances have produced!!! Please urge visits here by your friends and online contacts and please: CLICK SHARE BUTTONS at the top of this column. Thank you! YOU CAN HELP MAKE THIS BOOK 2015's #1 Action/ Adventure/ Mystery/ Romance Read by simply: ! 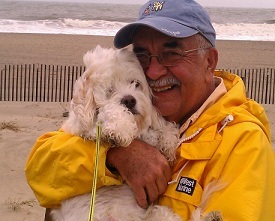 Author photo with Cavachon puppy, "BREEZY," at the top of this column is by PEGI TAYLOR. © Copyright 2019 Hal Alpiar and TheWriterWorks.com, LLC. - All rights reserved.